Click here for a printable PDF version of the Bidding Contract. 1. I agree to pay in full the bid amount plus buyer's fee and all applicable state and local taxes, with cash or certified check, in the amount owed on any vehicle for which I sign a contract. Full payment of purchase must be received within two hours of the item selling. Terms are cash or certified personal check. Personal Checks will not be accepted unless accompanied by an irrevocable letter of guaranteed credit from the bank stating buying limit and authorized by an officer of the bank. Letter of Guarantee is retained by Auction Company at time of issuing bid pass. Sight drafts are not acceptable. 2. All bidders may be required to provide Silver Collector Car Auctions with proof of means to pay for any purchases. Silver Auctions retains the right to require a cash deposit before issuing a bid pass. I give permission for you to obtain my credit information. 3. All vehicles or any other purchases are sold "as is" and without guarantees by Silver Collector Car Auctions. In no event shall the Auction Company be responsible for any guarantees. 4. All statements by the Auctioneers and those statements printed in advertisements are believed to be correct. However, bidders are to examine all cars and other items before bidding and do so upon his or her opinion and examination. 5. The Auction Company is not responsible for correctness of year, genuineness of make, model or options, mileage or any other description of the vehicles. These items are the responsibility of the owner/consignor of the vehicle. You are buying lot number item presented at auction. 6. All cars are offered for sale subject to a reserve price set by the seller unless otherwise stated, when allowed by state law auctioneer may bid on the sellers behalf up to the reserve price. 7. Ownership of an item passes to bidder when Auctioneer says "sold". At that time the new owner assumes full responsibility of the item. 8. Should any dispute in a bid arise the auctioneer will use his judgment and his decision is final. 9. All vehicles must be removed from the premises by the purchaser at his own expense within three hours of the end of the auction. If it is not removed, the Auction Company may remove and store the vehicle at the purchaser's risk and expense. 10. All state and local taxes apply unless you can meet and prove of out of state residence requirements and/or provide an Automobile Dealer's license and resale tax number. Out of state Purchasers must acquire the necessary transport permits. Cancel the sale and retain as liquid damages all payments made by the purchaser. Re-sell the property to a new purchaser at a private or public sale and in any such event the purchaser shall be liable for deficiency plus any incurred attorney fees or court costs. I agree to grant the right of immediate repossession without notice to Silver Auctions or its agents. 12. I agree to pay any state, city, or county fees for the paperwork transfer process. 13. I agree to pay a storage fee of $10.00 per day to the Auction Company for storage beyond the first banking day following the sale. 14. The Auction Company provides title only. Licensing (including any emissions requirements, vehicle inspections, plate and tabs) is the responsibility of the new buyer. I agree to pay in full, plus buyer's fee and all applicable state and local sales tax, with cash or certified check, the amount owed on any vehicle for which I sign a Bill of Sale contract. I understand that the entire amount of any purchase I make must be paid by 2:00 PM on the FIRST banking day following the auction, including buyer's fee and all applicable state and local sales tax. I understand that failure to pay for my purchases on time will entitle Silver Collector Car Auctions, Inc. and the consignor to hold me liable. This may include any incurred attorney's fees and/or court costs. 16. Vehicles guaranteed by the consignor to have less than 100,000 actual miles declared and sold for more than $3,000.00 are guaranteed by the consignor for internal engine components, transmission, and power steering. In the event a guaranteed item does not work, the buyer by request arbitration. All requests for arbitration must be filed within 24 hours of buyer completing sales transaction. If consignor agrees to repair the problem and it can be done in a timely manner the car remains sold. Silver Auction will control all repairs. Repairs estimated to be less than $200.00 by Silver Auctions are not guaranteed and are the sole responsibility of the buyer. 17. Titles for items purchased are mailed by certified mail to the purchaser on the eleventh (11th) banking day following the sale. Titles are only released to purchaser on cash transactions at the time of sale. Due to liens and titles held in safety deposit boxes, any title may be delayed up to thirty (30) banking days before it is released to Buyer regardless of method of payment. Auction Company will transfer title directly to retail purchaser where state law requires. Note: Title delay announced means the title may take up to 90 day to deliver to purchaser. 18. SPECIAL NOTE: As a Buyer of a car at this auction, I "explicitly waive my right to any implied warranty as set forth by state Law." As collector vehicles, these automobiles may not be fit for ordinary driving and reasonably safe and free of defects. This includes but is not limited to tires, brakes, steering, motor mounts, front and/or rear drive units. I agree to inspect each vehicle myself and ask the consignor of the vehicle to describe the condition of each vehicle. 19. Statements about the vehicles on the description sheets are provided by the consignor not Silver Auctions. All statements made by the seller are accepted as reliable. Silver Auctions shall have no obligation to verify seller's statements or claims. Any dispute regarding these statements including mileage must be made directly between consignor and purchaser without effect on the responsibility for paying for the purchase to Silver Auctions. 20. Jurisdiction/Venue-Governing Law. Guarantor acknowledges that Silver is a Washington Corporation with its principal place of business in Spokane, Washington. THE PARTIES EXPRESSLY AGREE THAT THIS CONTRACT SHALL BE CONSTRUED UNDER THE SUBSTANTIVE LAWS OF THE STATE OF WASHINGTON, THAT THE STATE COURTS OF WASHINGTON SHALL HAVE EXCLUSIVE JURISDICTION OVER ANY ACTION BROUGHT TO ENFORCE THE TERMS OF THIS CONTRACT OR OVER ANY ACTION ARISING OUT OF THE UNDERLYING TRANSACTION(S) WITH SILVER AND VENUE MAY BE HAD IN THE SPOKANE COUNTY SUPERIOR COURT SYSTEM OF THE STATE OF WASHINGTON. 21. 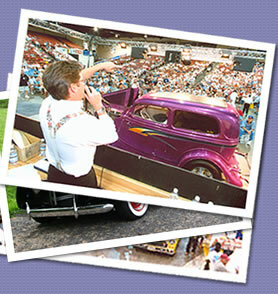 In the event of a dispute, all transactions with Silver Collector Car Auctions, Inc. may be combined together toward resolving the dispute. 22. The auctioneer may announce special circumstances that apply to the legal status of specific vehicles. These announcements are described below and are part of the contract to purchase that specific car. May Require Bonding - Buyer will be responsible for any bonding or licensing required in their own state. Not Street Legal - Buyer understands vehicle is only suitable for off-road use. Note: The following cars are US legal and no special announcement will be made. 24. Vehicles over 20 years old and all customized and modified vehicles are considered to have frame damage. Assume all vehicles are non-matching numbers with non-original engines, unknown or exempt mileage unless specifically described otherwise by consignor. 25. Any vehicle announced as a tribute vehicle was not originally manufactured as the vehicle it currently appears to be. 26. Legal Relationships between consignor and high bidder: In the event that the party to any contract(s) concerning said vehicle believes that the terms of a contract have been breeched, then all contract signatures for said vehicle agree, understand and accept that seller and high bidder have entered into a contract shall not be affected by such holding, and the remaining terms, conditions, covenants, agreements and provisions hereof shall continue in full force and effect. 27. If any term, condition, covenant, agreement or provision of this contract or the application thereof to any circumstance shall, to any extent, be held by a court of competenet jurisdiction or by any authorized governmental authority to be invalid, void or unenforceable, the remainder of the contract shall not be affected by such holding, and the remaining terms, conditions, covenants, agreements and provisions hereof shall continue in full force and effect. 29. A vehicles special announcements, if applicable, will be posted on each vehicle. You agree to read this form prior to bidding and your signature of the High Bid Acknowledgement is confirmation that you have read the announcement and accept the information as an element in your purchase contract.